A fresh 4.8 Surly Bud in the front and 3.8 Nate in the back are way better than the bald 3.8 Knards I had on there before. Working in a coffee shop out here pays just enough to cover the cost of (reasonably comfortable) living, so I’m wrenching a day a week at a cool shop in town in exchange for shop credit. Since keeping my bikes running are where all my extra funds would go anyway, it works out great. Our house is at the base of the inaccurately named Four Mile Road, which climbs eight miles to Sunlight Resort. 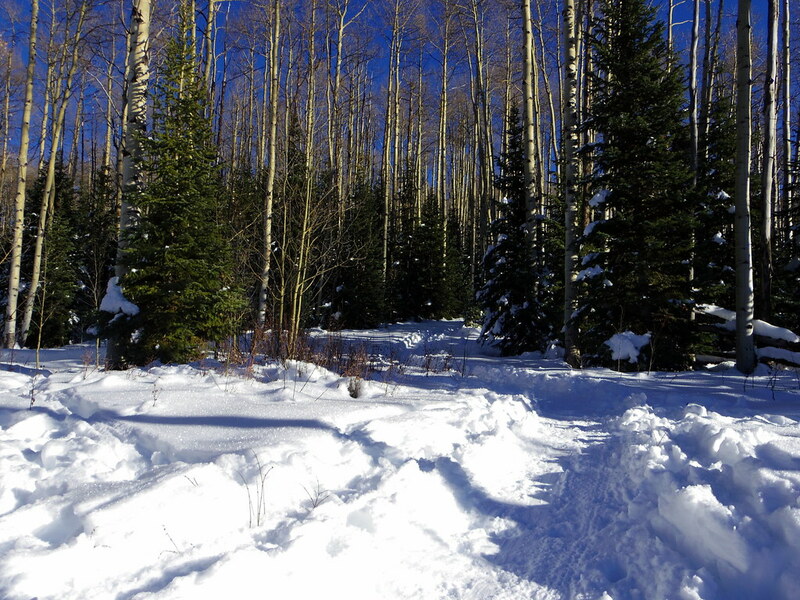 From what I can gather, Sunlight is the spot for fat bike riding in this part of the valley. There’s a group ride, that should be starting this week, that goes up to the mountain at night, climbs up to an XC ski warming hut for some beers, then blasts down the slopes in the dark. I’m looking forward to that. 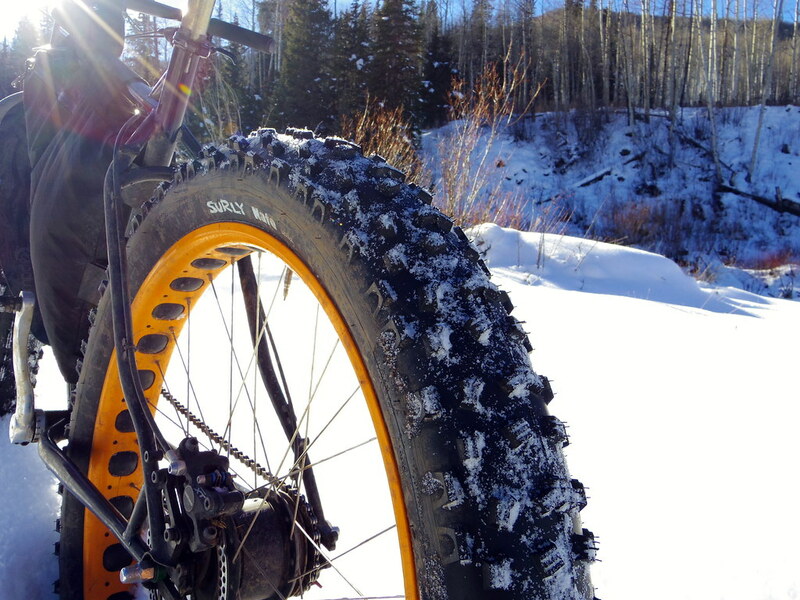 I’m really impressed with how well the knobbier fat tires work in the snow. Babbish Gulch is steep- it would be hard to climb in the summer on a single speed. I was able to sit in my low gear and power up the whole thing. 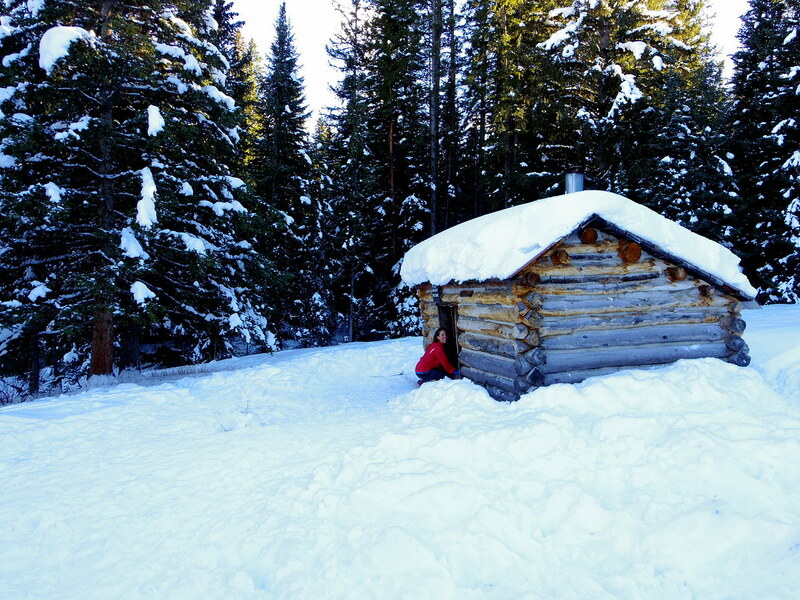 On top of a few feet of snow. After all the miserable slippy winter mountain biking I’ve done on 2.2 tires over the years, it blows my mind a little bit. 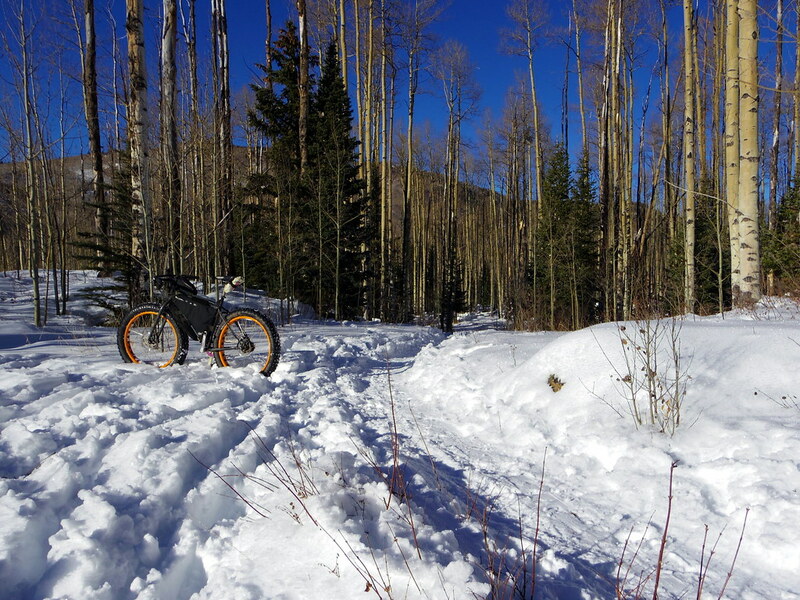 On the descent, the fat bike rides just like a bike. Braking, cornering, and control are excellent. Again, just a ton of fun. Colleen was running while I was riding, so it was a good opportunity to compare speeds. Climbing up the steep stuff, I was faster two days ago, and she dusted me yesterday. So we were about even, just like riding a mountain bike up a steep trail in the summer is sometimes slower than going on foot. Downhill, the fat bike was way faster, and never sketchy or out of control. And so fun. But I think I mentioned that already. But for whatever reason a lot of mountain bikers that I know, people who really dig riding bikes off road, still think fat bikes are incredibly stupid and wouldn’t think of getting on one. 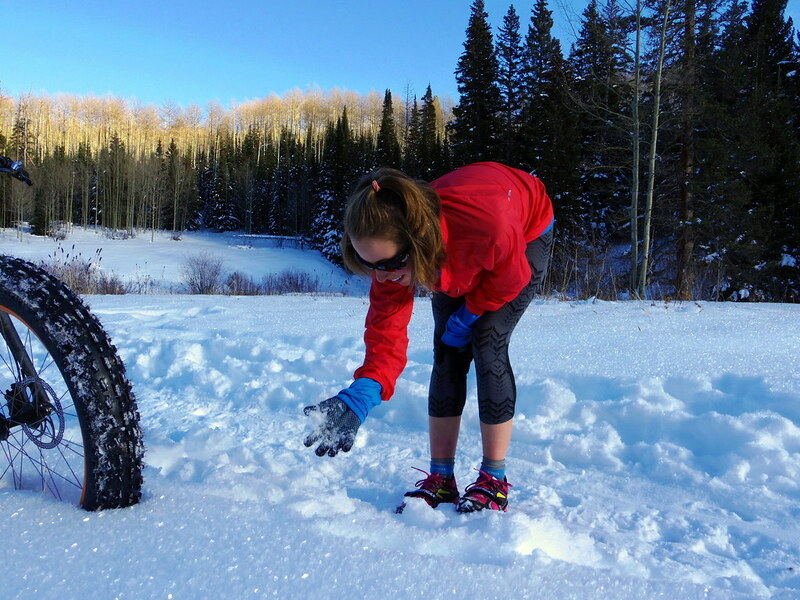 The tires are so good now that the bikes can handle a snow packed trail as well as a regular mountain bike handles a dry trail. 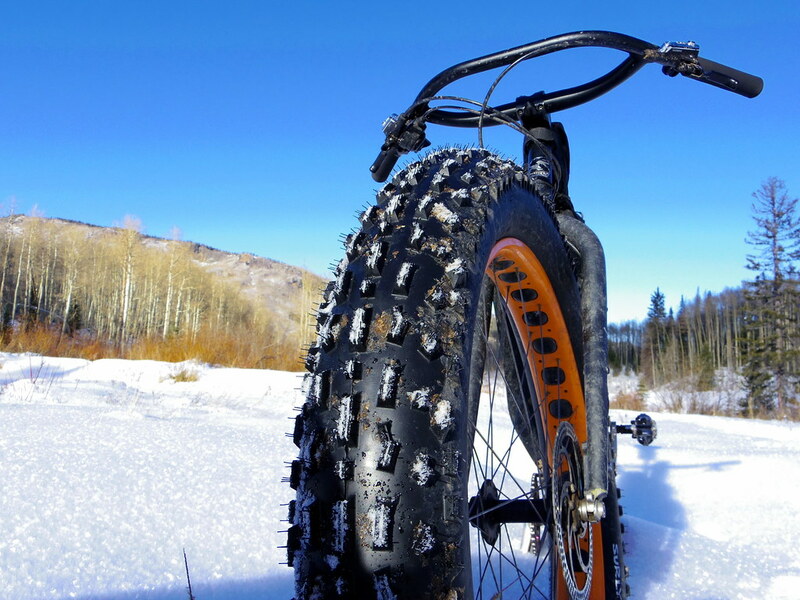 So aside from cartoonish good looks, why are fat bikes dumb? Can anybody clue me in? 1) They’re absolutely not necessary where I and most people ride. 2) I have bikes that work well already. 4) I like my suspension to have adjustable damping, rebound, & compression. Please don’t tell me messing with air pressure produces the same results. 5) I think you meant cartoon-ish bad looks. Never said they were good on dry ground, I’m also not comparing fat tires to a full suspension. Not even close to the same amount of control. They are kinda fun in the summer, but only because they’re so impractical and silly for that type of riding. I’m talking about riding in the snow (which is what this post was about), where they work way better than any other bike. So fat bikes are dumb if you’ve never had the chance to use where it runs real good? Fat bikes are dumb until you’ve actually ridden one. Montana- did not say dumb. Fat Bikes are purpose-less to me as I don’t live somewhere I need to ride one in the winter, across desert sands, or on the beach. I get that they’re fun, but I have two mtb’s, a fantastic commuter, and an old road bike already. Fun covered. Performance- because of point 1, what would the advantage be for me? Additionally, I don’t like the way they look, but that’s personal taste. Fat Bikes are another bike money pit. Enjoy the winter on skis! I borrowed Buerkle’s fat bike last year. It was great, and I’m pretty sure she hadn’t upgraded anything on it yet. Climbing snowy roads that I wouldn’t have climbed otherwise made for a fun night of riding, as opposed to drinking beer and reading blogs like I am this evening. A bike’s a bike. Ride on.